study of anime: giri and the shinigami: obligation and "being Japanese"
giri and the shinigami: obligation and "being Japanese"
Japan is often noted for quite a few ideas and cultural notions that are often alien to what we in the west encounter in our own culture. In a previous essay, I tried to explain and frame the idea of syncretism as a cultural force that has led Japan to become a dominant power in the world economy, by way of its almost innate ability to absorb and mold foreign ideas into something distinctly Japanese, and thereby create something entirely trans-national while still being relatable to the ideas of Japan as a whole. In this essay, I attempt to frame yet another Japanese cultural concept, one as old and easily as powerful as syncretism, as a driving force behind Japanese identity as reflected in their media. And, once more, I elect to describe it in terms of a popular creation, that of the shinigami. Giri is mostly easily described as the inherent Japanese idea of “duty and obligation, brought on through social interaction with another person.” (Yoshida 1996) But framing it in those words would not do the concept justice. For while giri is all those things, it is also an aspect of Japanese culture that has influenced them for as long as they have been a people, and is in fact one of the, if not the, most powerful force in Japanese culture. If Shinto is the sacred idea of being Japanese, giri is the cultural and community idea, and it still holds the same sway now that it did when Japan was young. Yoshida’s article gives several set examples which illustrate this point, and can be found here. Iwasaka and Toelken, while discussing the idea of ghosts and spiritual appeasement, also took the time to mention the contributions of giri. They tied it in with another concept, synonymous with the notion of giri, that of on (1994, 18-19). On, like giri, is a system of repayment of obligations, usually between parents and children/older generation and younger, tied into the idea that the subsequent generation is engaged in almost a perpetual cycle of repayment to their parents, mostly over the love, nurturing and kindness shown to them by the older generation. Taken outside the family context, it asserts that whenever help is provided from a “social superior,” the one receiving the assistance is entered into a system of repayment that has no strict time limits, but neither does it have a definite idea of how and when the payment is considered fulfilled (1994, 19). Owing to the inherent “complexity [and ambiguity] of status relations, one never has a sense of being caught up on all the debt- one always lives with apologetic knowledge of being unequal/behind” (1994, 19). Of course, Iwasaka uses this idea to illustrate how these kinds of debts and obligations, if forsaken, can lead to the creation of restless dead and hauntings, which in turn leads to the almost military-like precision of rituals that are sometimes eternally ongoing in the lives of the bereaved, lest they create a hostile spirit. Giri also contains the inherent idea that these obligations and duties often are made without request, as if anticipation of need and response is more important than actually asking for it. This subjectivity with regards to giri is also extremely ambiguous, because both parties involved in the exchange might have different ideas of what constitutes “enough,” but at the same time, personal honor might limit them from criticising the other person. Giri is inherently social, in the end, and Yoshida mentions it might be incompatible with legal precedents and situations. It is also very personal, and as such, satisfaction of the other party is taken very seriously. Beyond simple duty and repayment, it can also bleed into ideas of reciprocity and “keeping up appearances” at times, despite the capabilities and resources of the person compelled by it. This is a lot of information to digest, for certain. But where did giri come from, and how did it attain such power? There are several main “culprits” for this idea. Going back to the previous article, Yoshida mentions how giri evolved out of an idea known as seken-tei, which was itself a Japanese business practice whereby merchants would be very concerned with “keeping face” and maintaining status and integrity in dealings and in life. The term itself can be translated as “social appearances,” which admittedly is something we as Americans are very familiar with. But in the case of Japan, this idea is rooted firmly in maintaining status through honor and noble action, rather than just in terms of merchandise or wealth items. But this is only part of where giri came from. One of the strongest influences on the idea of giri comes from Japanese history and religion itself. Japan, as a nation, is in a very unique situation. Situated on an island with limited resources, but a burgeoning population, the Japanese have had to band together for a long time for survival. As with any culture dependent upon rice and limited agriculture for survival, the idea that community was more powerful than personal fulfillment was something bred into them as a people. Work needed to be done for the community, then the family, to ensure they had enough to eat in the end, and until that was done, the individual had to wait. Joseph Campbell (and to a lesser extent, Ruth Benedict) argued that this worked its way into the Japanese sacred system, as embodied in the idea that “the nail that sticks up must be hammered down,” meaning that subordination of individual desires was crucial to both the sacred and secular life of Japan, if not all of East Asia. While this idea was often criticized by scholars and practitioners of Japanese sacred customs as inaccurate, or extremely generalized, it still holds some sway. When Confucianism swept into Japan, it brought with it another idea that would cement the notion of giri and strengthen it’s hold on Japanese social customs. Confucianism, already a force for personal honor and a strong moral code in China, appealed greatly to the Japanese social/moral system. The idea that a complete philosophy dedicated to the idea that family and community were more important than personal desires, caught on like wildfire, especially when the shogunate seized power. Building upon this idea of bushido and personal honor, Confucian ideals were inserted in social customs, with a firm rank system for the citizenry and nobility, which was driven by the desire to remain morally upright, honorable and aware of the ideas of duty. This influence stayed in place when the shogunate fell, even as the other traditions advocated by it, like Buddhism, were being marginalized and stamped out. Neo-Confucianism would go on to become a central principle behind State Shinto, with national obligation fueling the idea that morality born out of the East was superior to any tradition espoused by the West. And when State Shinto itself was forcibly dissolved following WWII, the idea of Japanese nationalism and unity remained in place, untouched by the Decree of Renunciation. 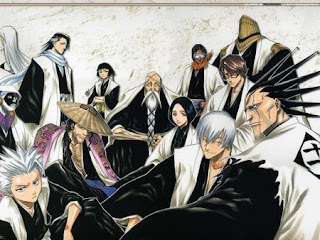 So, if giri is one of the most important concepts in Japanese culture, then let us now look at a representation of how giri can be seen in modern Japanese culture, through the shinigami to which giri is of paramount importance: The Soul Reapers. For those unaware, the Soul Reapers are the organization of shinigami from the manga/anime series Bleach. From outward appearances, they function as an ordered, military style unit focused around the duties of a)gathering the souls of wayward spirits (the Restless Dead, in sacred terms) and releasing them to the “other side,” or “Soul Society” and b)defending humanity from the threats born by the “hollows,” or spirits that not only refuse to cross over, but which function as monsters, eating the souls of the living and dead, and causing harm to the natural order. They are broken down into 13 court guard companies, each with a commander, adjutant commander, seated “officers” and associated Reapers, who are then given tasks and territory and instructed to keep things running smoothly. Looking at the Soul Reapers from a bit closer, we can see that these shinigami are, in fact, extremely influenced by the idea of giri. Much like the samurai of the same shogunate that elevated the notion of giri to a national level, they are seen as an idealization of the idea of protectors, defenders and warriors of the “government,” in this case the elder sages of the Seiretei. They are responsible for their individual tasks, and the completion of those tasks is of utmost importance. Death in the name of service is seen, time and again, as an honorable thing, and Soul Reapers are instructed to give their lives to save the humans, regardless of whether or not the enemy faced is insurmountable. They dress in the same manner as classical samurai have been portrayed, possess personally bonded weapons that become identified with the Reaper that wields it, and practice the same code of bushido that history has romantically attributed to them. As samurai are often synonymous with Japan, honor and loyalty, they are, in essence, a representation of idealized Japan, and something that the Japanese should aspire to be. Their foes, the hollows, meanwhile, represent an idea of what is seen as improper action in Japan. Hollows themselves are rarely evil, but often the end result of selfishness, desire that persists beyond death, and the idea that a self-centered person, more concerned with material goods and temporal events, has lost their way and cannot proceed according to the natural order. (In volume 4 of the manga, the deceased administrator of Karakura Hospital exemplifies this notion- he ran the hospital in exchange for prestige and power, not because it was his family duty to maintain it and serve the community.) This idea that regrets and selfishness are the cause of suffering falls in line with the Japanese notion of sin- sin is not a violation of divine commandments, but rather a state of impurity caused when one strays from the path of right action and, by extension, devotion to giri and community. Since they lived their lives utterly devoted to themselves and not toward filling their roles in the community, they become “hollow” in death, and seek to fill the void left within them by devouring the souls of others. This paints the Soul Reapers, and indeed Bleach itself, as a notion of what it means to be Japanese, at least from a sacred/cultural, and indeed romantic, mindset. The Soul Reapers are effectively demonstrating how a Japanese person “ought to act.” Though highly idealized, it also offers a look into one of the core principles of Japanese society, and gives an idea of what it means to “be Japanese” at some level. Now take a look at what might be the opposite depiction of idealized Japan- the shinigami from Death Note. Much like the Soul Reapers, the idea of giri figures prominently into their execution, but unlike Bleach, it takes on a whole different meaning. Then look at their actions. Shinigami here are very petty. They spend their time playing dice games and spying on the human world. They kill people in order to extend their own life spans, as they are terrified of the prospect of their own deaths. While they may intercede on the behalf of a human, if they do, the end result is their own death (ostensibly a noble idea meant to preserve the natural order, here it is portrayed as an act that violates the precepts of being a shinigami, or at least that’s how it can be interpreted. 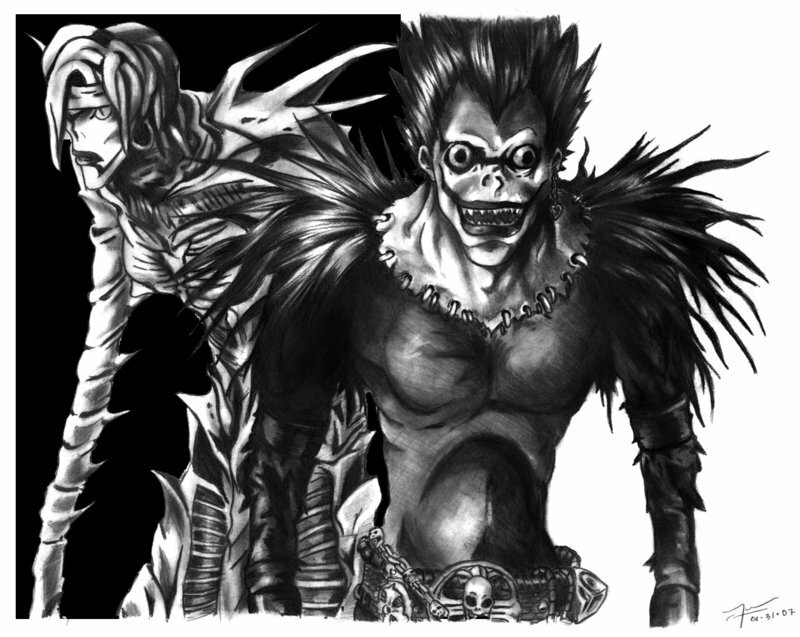 Noble action=punishment by death, according to Ryuk. Noble sacrifice? Maybe, but not likely. Gelus was infatuated with Misa at the time. The closest anything comes to the idea of noble sacrifice was Rem, also acting out of “love,” in this case Misa’s love for Light). While they once had duties and responsibilities on par with those of the Soul Reapers, those times have long since faded, gone as humanity essentially forgot them. But they did not forget man, and now regard us as little more than sources for “immortality,” or at least a repository of life energy. Or, put simply, screw humanity. We didn’t live up to our end of the deal, so why should they? These shinigami live outside of their duty and ignore their obligations, justifying it by pointing out man has forgotten its own. 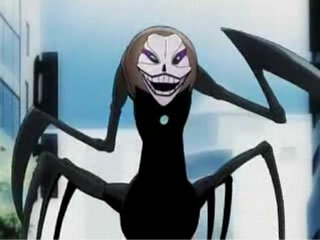 In this, the shinigami from Death Note embody a rejection of the idea of giri. Whereas giri is duty, the shinigami openly ignore it. They know that it exists, and acknowledge that they once undertook it, but those days are long dead, and they no longer care to perform as they once did. In this regard, these shinigami are an idealized vision of what it means to be “gaijin,” or “not-Japanese,” and live by a code of conduct that would be counter to the one that Japan has needed for survival since time immemorial. Rather than be the product of sin, they are in some ways created and sustained by that same sin that can create hollows, but as they were never human, are far more dangerous. They are not hollow, they are bitter, and bitter gods often bring hell to pay. They are, ultimately, an example of exactly how a true Japanese person should NOT act. There is yet another way in which this can be considered. If the Soul Reapers are in fact “ideal Nihonjin,” and the shinigami from Death Note “gaijin,” then it speaks to a concept found within Japanese culture since the pre-war years. After the Meiji restoration, Shinto and Confucianism gained a great deal of recognition and validity by the newly restored Imperial power. Shinto was seen as the inherent religion of Japan, the Emperor the descendent of the goddess Amaterasu, and it was the cornerstone of what made Japan Japanese. Confucianism espoused the tenets of giri to high regard- death in the name of the state was said to be the highest honor a Japanese person could attain, as it further strengthened the Japanese goal of unity and community more than anything else. These two ideas were utilized to create a sense of nationalism rarely felt in the world, especially at that time. During the immediate pre-war years, a good deal of the Japanese nationalism was brought to bear against Western encroachment, the idea that the West brought with it materialism and a strong sense of personal pleasure, something that was not only foreign to the Japanese idea, but essentially toxic. Concern that this materialism might poison the country, the government used giri, and the powerful mechanic of State Shinto, to bring the people of Japan together, and direct them to attack the source of this perceived corruption- the Western powers, embodied in the United States. Because the United States was seen as too concerned with individualism at the cost of cohesion, this was quickly demonized and used as fodder to stir flames of Japanese patriotism and the idea of supremacy through duty. While the war has been over for a long time, the same sort of dialogue can be inferred from looking at these two types of shinigami. Soul Reapers are worthy of respect, are selfless and plainly the heroes of the people they protect. The shinigami, however, are conceited, selfish and monstrous, anything but noble to a Japanese person, and a reflection of the problems with an individualistic society. They are the enemy, the “gaijin,” and they kill without reason for purely selfish gains. Avoid them, do not act like them, lest you forget who you are. Masayuki Yoshida. "Giri: A Japanese Indigenous Concept."